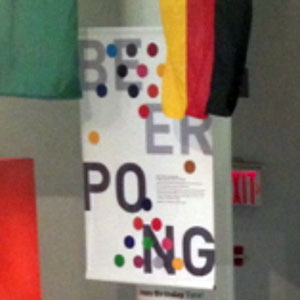 The Great Beer Pong Tournament of 2013, and a lager shandy, please. I work at the kind of office where people all have titles like Senior Business Head of Global Creativity Strategy, and suchlike, so I didn’t guess when I was re-writing Tom’s bio, that he was in fact, seriously senior. Kind of my boss’s boss senior. Conversation turned, as conversations do, to beer pong. “You any good?” he asked. “Absolutely!” I replied with confidence, thinking back to my 2 summers-ago victory at throwing beanbags into a board with holes in it. “Great!” said Tom. I’ve been looking for a partner in the annual company beer pong competition. Let’s do it!” I assumed this wasn’t a real thing, so I let it slide, but a week later, an email from Tom. “I signed us up!” Apparently we had to represent a country, possibly some kind of metaphor for Creative Strategic Global Business or somesuch. Anyway, the UK was taken by one of the 39 other teams taking this whole thing Way more seriously that I expected, so we opted for Western Samoa, and hoped to bring the island a little taste of victory. “What exactly is beer pong?” asked Jon. It was the salient question. “It’s where you throw bean bags into holes on a board,” I said, confidently. 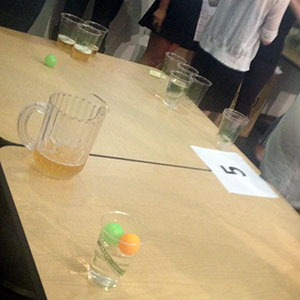 “So I have to throw ping pong balls into cups of beer?” That seemed to be about the size and shape of it. “How hard can that be?” turns out; Very. 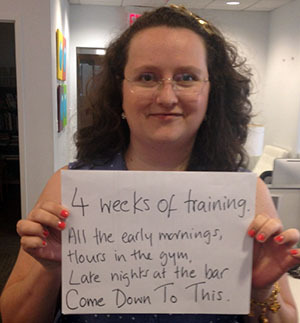 This is the part of the story, where, if it was a movie, I would start the Training Montage. See Kate walk out of K-Mart with 2 dozen ping pong balls and a bag of red plastic cups. Laugh as Kate measures the Official Beer Pong Rules distances on her dining room table. Chuckle as Kate sets up a pyramid of cups and begins to throw wildly and inaccurately. Ha! That ping pong ball landed in a cocktail glass on a shelf in the living room! Ho! That ping pong ball landed in Jon’s full mug of cappuccino! See Kate try again. Every morning for the 2 weeks before the contest, I set up the cups, and threw balls somewhere in the region of them. Every day Tom would pass me on the way to the photocopier and say something like “Hope you’re ready for this!” or “I’m counting on you Team-y!” or “if you screw this up for me I may well have to fire you!” Actually, in fairness, that might have been more of an implied look, than an actual thing he said. The night before the contest, I completed my final training session. As balls pinged erratically to the four corners of the apartment one fact became blindingly apparent. I was no better at beer pong now than I had been 2 weeks ago. “It’s time to go for confidence and brawn over actually skill,” I told Jon. “I’m going to make us badges. I’m going to come up with a team chant. How about, “Let’s Go Western Samo(a)!” The plan was, to make a whole ton of fuss, which would, ipso facto, distract from the fact that I could no more Beer Pong than I could fly. “Well, I have won three out of four Office Beer Pong Championships,” said Tom modestly. Oh dear God. All day, people I’d never met before in my life wandered up to my desk to wish me luck, or to tell me that this year they’d been training hard and this would be the year they defeated Tom. This did little to improve my mood. 4pm, tension was running high in the office as the 40 Beer Pong pairs assembled in the café, eyeing each other up like sharks, pretending it was no big deal, but knowing in their hearts that it was. “This should be fun!” I said, which was a lie. “Yes. Because we’re going to WIN!” said Tom, with no obvious side of irony. It was clearly time to start drinking. “Sudden death. 3 cups, one ball each” We started. Several rounds of wild bounces, and near misses. And then, the accountants forged ahead with one miles-off miss and one bulls-eye hit. The ping pong ball literally trembled in my hand. I aimed, threw, and IT WENT IN THE CUP! Tom went next. POW. Hole in one. OMG, we might make it through round one. And then, suddenly our movie montage was over. The accountants went two balls for two cups. We were done. Finished. Out. The shock waves rippled through the café. Tom’s out? Oh my God! Tom’s out? Seriously? THE Tom? For Real? “Bad luck, team-y” I tried. He ignored me. I think it very likely I will be fired. Light enough for a summer afternoon – totally not legal for beer pong. 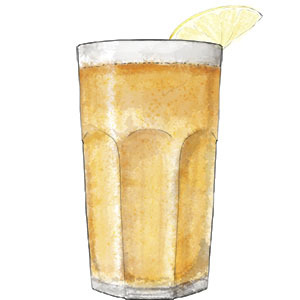 1/2 pint of lager, 1/2 pint lemonade – both really cold. Squeeze in a wedge of lemon. And relax. btw this is amazing with blueberry lager. 2 Responses to The Great Beer Pong Tournament of 2013, and a lager shandy, please. I wish I had known you were in training. I have played beer pong for most of my drinking (legal and pre-legal) life! I’m not going to say that makes me any good nor that I would have been a decent coach, but we sure would have had fun! I could totally have used the help! I still have all the ping pong balls, so we can play sometime. i intend to train for next year.